Preliminary design drawing for Battleship # 40, which was planned for construction in Fiscal Year 1915. This plan was one of five alternative designs for this ship presented to the Executive Committee of the Navy’s General Board on 10 October 1913. This design resembles that adopted for Battleship # 38 (see Photo # S-584-041) but is larger, having five 16-inch gun turrets rather than four triple 14-inch gun turrets. 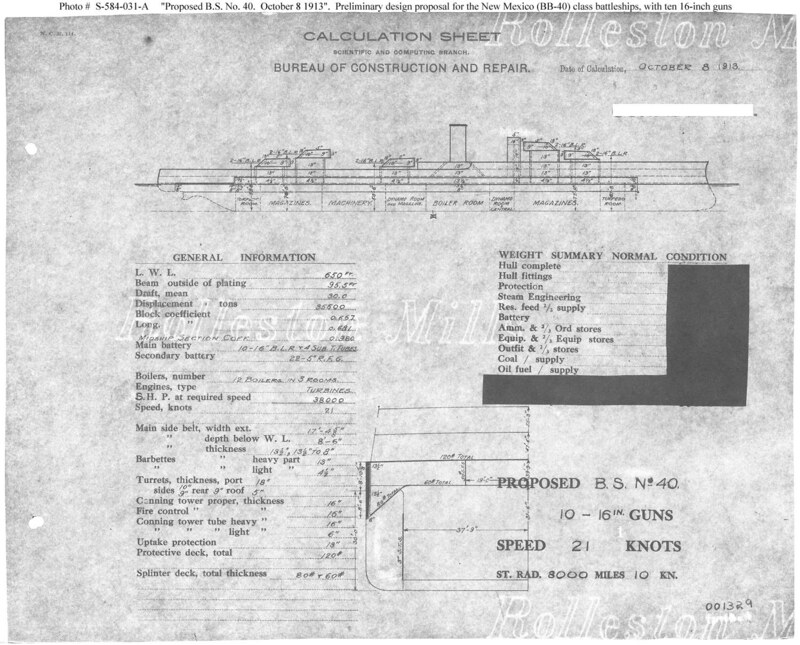 This plan provides 13.5-inch side armor, as in Battleship # 38. 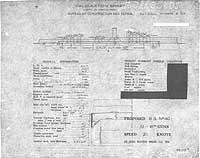 This plan provides ten 16-inch guns, turbine machinery, and a speed of 21 knots in a ship 650 feet long on the load water line (L.W.L. ), 95.5 feet in beam, with a normal displacement of 35,500 tons. Battleship # 40 ultimately was built to a design very similar to that of Battleship # 38, mounting twelve 14-inch guns.